Leviathan is an unusual steampunk adventure, as the action is set during an alternate history of World War I, rather than the Victorian period. In this story, the British style themselves as "Darwinists" and have a formidable air force composed of genetically modified "beasties." Their German opposition, known as "Clankers" use over-sized metallic walkers and tanks. The story follows, in mostly alternating chapters, two young protagonists, Deryn, a.k.a. Dylan Sharp, a midshipman in the British air navy and Aleksander Ferdinand, son of the murdered Austrian Arch-Duke and a budding Clanker pilot. Alek is the son of the recently murdered Arch-Duke Ferdinand of Austria. He is on the run, aided by two of his loyal retainers, and remains one step ahead of the war-mongering Germans, as he attempts to re-group and prove his legitimacy. The thing that surprised me the most about Leviathan was my own reaction to the Darwinists. I found myself thoroughly skeeved out by the description of the living airships, with their attendant symbiotic life-forms creating a self-sustaining biosphere. A typical ship would be mostly whale, with perhaps a bit jellyfish and a number of other "life threads" mixed in. It would be accompanied by double-nosed hydrogen sniffing dogs, flocks of bats and birds, messenger lizards and more. Plenty of thought went in to how the living airships would be fed and how waste management would be handled. Oddly, the "Clanker" steam-driven technology, appealed to me much more. How awesome would it be to pilot one of those? From the description in the book, they sound just like the AT-AT walkers from Star Wars. 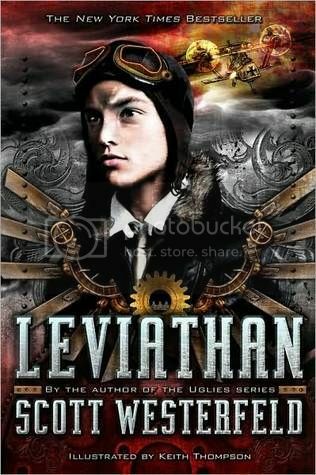 I'll recommend this for Westerfeld fans, and steampunk aficionados looking for something a little different.